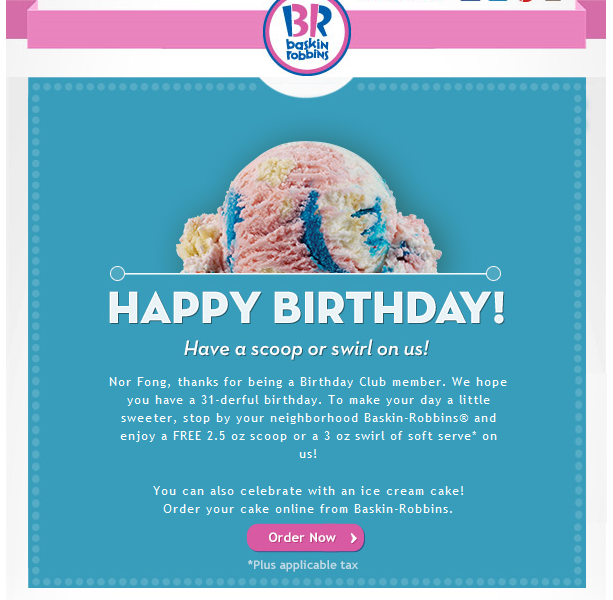 These coupons and deals for Baskin Robbins have expired but may still work. $3 Off An Ice Cream Cake Or Cookie Cake $15 or more Code: SAVE3 At participating locations. Not valid on $12.99 cakes. Buy 1 Cone, Get One Free At participating locations. Offer is valid for any flavor. Excludes waffle cones. Limit one coupon per customer per visit. Coupon must be presented at time of purchase. No cash refunds. Ice Cream Cakes Starting At $12.99 At participating locations. $2 off any Polar Pizza Ice Create Treat. Code: POLARPIZZA At participating locations. Ice-Cream and frozen novelty desserts.